A new twist on the classic Baked Ziti, this casserole is made with ground beef, penne, BBQ sauce, milk and shredded cheese. It's a Creatively Delish favorite! Thank you, Mom, for bringing this to the table so many years ago! This is the kind of comfort food that no one can say no to. It's a top choice for my roommates when I ask them what I should make and leftovers generally never exist. Not only is it good, it's a breeze to make. 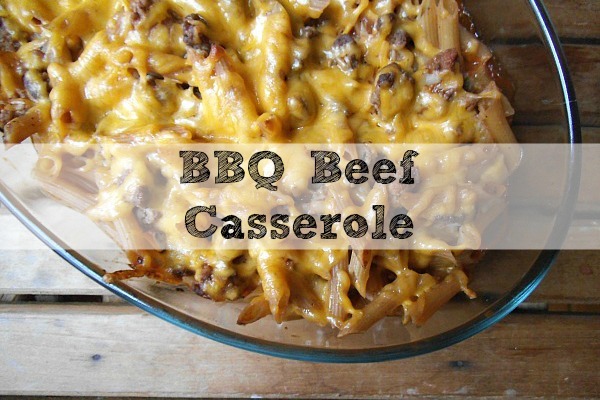 Much like baked italian ziti or mac & cheese, this combines ground beef and onion, penne or ziti pasta, lots and lots of BBQ sauce, lots and lots of cheese and a little bit of milk to get it to a creamy consistency. Yikes, I get hungry just talking about it! This is also referred to as "Train Wreck, BBQ Style"
When preparing the beef, cook it in a large pan for a few minutes before adding the onion. Once it has all cooked through and the onion is soft, drain the pan of any excess oil and fat before transfering it in with the pasta and BBQ sauce. In the directions you will see that I bake it to allow for the cheese to melt, but then I broil the top to let it crust up a bit and brown. I love that cheesy crusty texture, but if you don't, just continue to bake a little longer to be sure the cheese has melted enough on the top and through the middle as well. In a large bowl, combine noodles, beef and onion, BBQ sauce, ¼ of the cheese, and milk. Transfer to an oven proof dish and bake for 10 minutes or until cheese is melted and the top starts to bubble and brown up a bit. Copyright text 2018 by Creatively Delish. Get 100% free access to the first module of my online cooking course! Get all 5 lessons in the first module of my online cooking course, for free! Included are tips on how to make dinner healthier tonight, a printable Perfectly Stocked Pantry List, and more!